Digital Bins are digital text sets. We have used these in book clubs, nonfiction units, and to teach literary elements. In our book, Teaching Interpretation: Using Text-Based Evidence to Construct Meaning, we have created digital bins that you can use. They increase student motivation and layer students’ understanding of concepts. To find out how you can create your own Digital Bins and see a sample, click here. 10) Student Choice! Digital Bins allow students to read a variety of texts related to their topic, and they make choices about which information is valuable. Also, with a variety of reading levels present in any classroom, the creation of these bins is one way to differentiate reading levels. 9) Independence! A shift from the typical student-teacher power dynamic, Digital Bins allow students to work independently in small groups. They are also initiating ideas about what to add to the bins and what they can REmix and create. 8) Collaboration! Digital Bins are “living folders” that teachers and students create and add to across a day, unit, and year. 7) Multimodal! From video clips, to audio, to primary source documents, Digital Bins allow students to engage with a variety of different multimodal texts. 5) Creativity! Students’ affinities for the arts, music, and technology can be drawn upon for work in the Digital Bins. 4) Sharing and Exchanging! There is a focused energy created in the classroom sparked by digital bins where students are highly engaged and enthusiastic about contributing to the learning process. 3) REmixing! Students create and remix content by creating book trailers, book advertisements, or presentations. 2) Audience! Digital Bins provide a larger audience for students. With an audience, students are more likely to compose thoughtful pieces. An audience may also provide feedback and responses to student work. 1) Everything! There are numerous benefits of using digital bin in reader’s workshop, but they also help to connect all facets of learning across the discipline areas including English/Language Arts, technology, History, and Science. 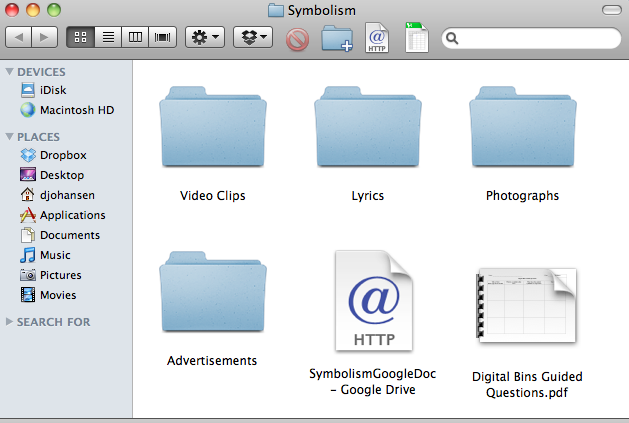 The work that is generated in Digital Bins can be used to construct arguments essays, feature articles, speeches, etc. for all curriculum areas. I had trouble getting the link to open, but am really intrigued by your post. Lots of great info. Arggg! I hate when that happens. All fixed! Thank you so much for letting us know! The link on how to create digital bins did not work. Any suggestions? I really enjoyed your workshop at Literacy for All! Thank you! Thank you so much, Kathleen! All fixed!